If you want to insulate your roof, there are a number of factors to consider. One critical aspect to consider is the simple fact that the roof is usually the most exposed (and expensive) feature of the entire structure. The exposure to extremely harsh conditions affects not only the roof’s overall look, but also its strength and durability. Of course, if the roof is compromised then the integrity of the whole structure will be affected. Our advice to ensure a strong and dependable roof is to protect it with spray foam insulation. Doing so will prevent moisture, mold, mildew and other caustic conditions to prematurely weaken your roof. In fact, since spray foam has been proven to increase the rigidity and strength of the roof, it will actually extend the life of your structure. Ultimately, this will help prevent premature repairs or even costly replacement. At this point, the fact that insulating your roof with spray foam will reduce your energy consumption and save you possibly thousands of dollars a year, almost seems like a value-added bonus. However, it is worth stating the obvious here; the roof is usually the structure most affected by external temperatures which contributes directly to indoor temperature control. This highlights the amazingly beneficial impact that insulating your roof will inevitably have on the overall comfort, economy and durability of the building. The suspended aluminum particles in our roofing material reflects UV radiation which contributes significantly to the reduction of air-conditioning expenses of any structure. The surface temperature is maintained as low as possible thus providing maximum impact on energy output. 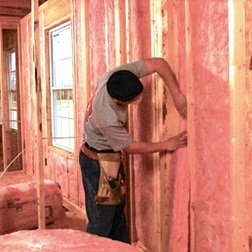 Reduced utility costs are a great reason to opt for spray foam insulation for your property’s roof. For property owners who desire Eco-friendly and green living features in their private homes or commercial buildings, spray foam roofing material is the ideal option, as it ensures optimum conservation of energy and the product itself is non-toxic. Being a lightweight material, spray foam will not cause the roof to sag prematurely. In fact, as mentioned above, it will actually increase the rigidity and strength of nearly any roof structure. As such, it ensures a better tolerance to probable snow load, and effectively reduces the risk of roof sag, which is unique among all other roof insulation materials. Only spray foam can offer a completely seamless installation with no risk of leaks or cracks between layers. The elastomeric properties of the material ensures complete and effective sealing of all cracks and crevices, simultaneously preventing moisture penetration while providing optimal insulation. As opposed conventional materials, spray foam is the only one that conforms naturally to any shape which reduces the risk of parapet, vent and stack leaks. Spray foam insulation has a high “R” value, which is the most objective way to measure any the material’s resistance to extreme temperatures. The only insulation material which seals so completely that it virtually eliminates any risk of water leakage in or out of the insulated area. Among the many advantages of this aspect of spray foam insulation is the reduced possibility of developing mold or mildew in your stucture; a feature that has implications for both the health of your building and your body! Only fast and easy maintenance is required with no long or tiring procedures involved to ensure the proper condition of the insulated roof. Since the spray foam material provides nearly 100% protection from moisture exposure, the risk of your roof rusting is extremely limited. The material is ideal for new construction, but can also be incorporated into re-roofing projects. The material prevents water from “ponding” (collecting) on the roof. It can be applied and shaped to direct excess water to the roof ducts and drains for optimal shedding.